The ATLAS Collaboration has over 5500 members in 182 institutions around the globe. But, did you know that over 1000 of these members are PhD students? ATLAS PhD students contribute strongly and critically to all areas of the experiment, while learning valuable skills for their degrees. Since 2010, the best of the best have been celebrated at the annual ATLAS Thesis Awards, which highlight outstanding contributions to the collaboration in the context of a PhD thesis. The theses considered by the jury could cover any area of ATLAS physics, from detector development, over operations, software and performance studies to physics analysis. Indeed, all awarded theses cover at least two of these areas to considerable depth. 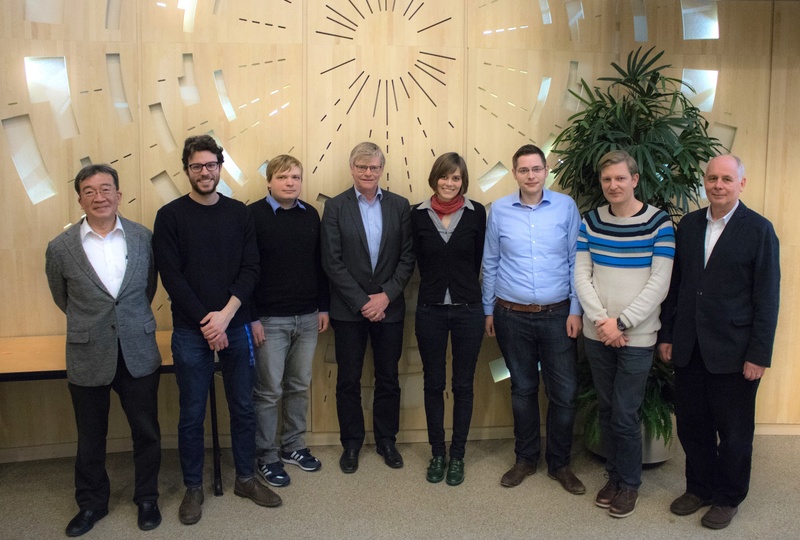 On 22 February 2018, at a celebration in CERN’s Main Auditorium, five new winners were announced: Pierfrancesco Butti (Nikhef), Johanna Gramling (Université de Genève), Oleh Kivernyk (Université Paris-Saclay), Philip Sommer (Albert-Ludwigs-Universität Freiburg) and Markus Zinser (Johannes Gutenberg Universität Mainz). During the awards ceremony, the winners gave presentations about their thesis work in front of members of the ATLAS collaboration, including ATLAS Spokesperson Karl Jakobs. He shook hands with each student and – together with ATLAS Collaboration Board Chair, Max Klein, and Deputy Chair, Katsuo Tokushuku – presented them with certificates and an engraved glass model of the ATLAS detector.